NEW STORIFY OF LIVE TWEETS! : Hearing held off, to be rescheduled when current judge on the case comes back from vacation. To the elation of Uta Von Schwedler supporters and son Pelle Wall, bond remains at $1.5 Million for now. I live tweeted the bond reduction hearing for John Brickman Wall, a Utah Pediatrician charged with murder of his ex-wife. Wall is charged with breaking into his ex-wife's home on late Sept. 26 or early morning 27, 2011 and murdering Uta Von Schwedler, 49, a University of Utah biologist inside her Salt Lake City home. Click here for a quick recap on what happened in the case leading up to the alleged murder. The family of the deceased Von Schwedler has said they believe Wall killed her out of frustration he was losing a bitter custody battle over the couple's four children. Medical examiner reports show a sign of a struggle and cuts on Von Schwedler's body that indicate possible defensive wounds. She was found in ice cold water in her bathtub with a knife underneath her and a lethal dose of Xanax (anxiety medication) in her system, a medication she did not have a prescription for. Wall requested a reduction to his $1.5 million cash-only bail from the Salt Lake County Jail. His attorney Fred Metos contests that Wall is not a flight risk and the bail should be lowered to $100,000. The change in bail amount would mean allowing Wall to leave jail while awaiting the murder trial. Various witnesses, family members, friends from both sides and even Wall's oldest son, who has accused him of murdering his mother, are expected to testify during the hearing. His 19-year-old son wants him behind bars. National TV Good Morning America appearance discussing a case I have covered from the beginning about a Utah doctor charged with murdering his ex-wife and leaving her for dead in her bathtub. When I was a reporter for The Salt Lake Tribune I incurred a story many reporters do on a regular basis. It was so unbelievable it couldn't be true. As an intern reporter one time I fell for this and got burned and wasted several days if not weeks chasing down a murder story that never turned out. I learned my lesson and became highly skeptical for future stories that didn't pass the smell test. 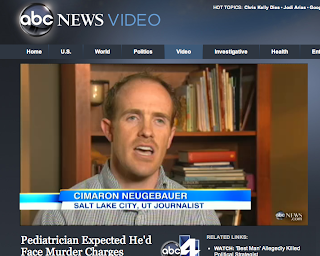 In this case, a man, a wealthy pediatrician in the Salt Lake City area, is believed and reported by neighbors to have murdered his ex-wife in her own house and drown her in a bathtub, then leave her until the dead woman's boyfriend finds her after he goes to her home after not hearing from her for most of the next day. Police initially called it a non-significant event and an unattended death, likely believed to be a suicide. But a few things didn't add up. When I canvassed the neighborhood and talked to neighbors in Oct of 2011, just two weeks after the death. Everyone said police were discussing how this looked like a homicide. Then after I called neighbors back to discuss those claims further they clammed up and said they no longer wanted to talk because they didn't want to mess up the police investigation or get in trouble for pointing out an issue. So I knew there was some digging to be done. I started talking to the family. They said I was the only news outlet or reporter to give them the time of day. I had them dump all the information and heresy on me and I would go back and document and back up the missing pieces with court recordings or corroborate in other ways. I landed an exclusive interview with the oldest son when he publicly accused his father of killing his mother and moved out. And I ran the first story on the death possibly not being a suicide but a homicide, despite police claims. A document of all my stories are found here on the justice for Uta website. Fast forward to late April 2013, the ex-husband, John Brickman Wall is charged with murder and burglary for breaking into his ex-wife's home and killing her with a knife and giving her a lethal dose of Xanax. DNA evidence of him was found underneath the ex-wife's fingernails. Now that a national audience begins to watch this case, I continue to report it as a freelance reporter, having left the Tribune to pursue other ventures that paid better to support my family and allowed me to still report on the side. I left the Tribune in March of 2013, about a month later the charges are filed against Wall. A few days after the story runs, it is picked up nationally and I get a call from New York City from a producer with ABC News and Good Morning America. He asks if I would like to appear to talk about the case. Absolutely I would! This case has been something I have been working on extensively for nearly two years, and it is just about to get even stranger. I hope you enjoy following my reporting. I will continue to update on here. Check back often for updates.